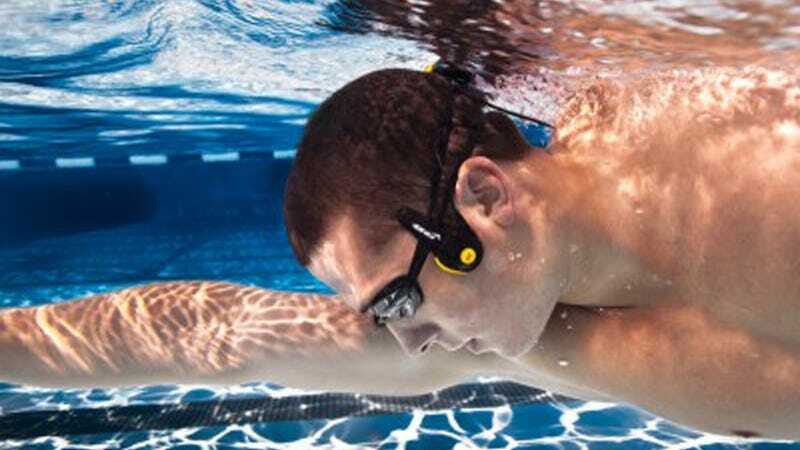 It's hard to listen to music while you're swimming because even waterproof earbuds that actually stay on try to conduct sound through air to reach your eardrums, and there's not a lot of air underwater. The FINIS Neptune works on this issue by sending sound waves straight into your face. Total bombardment. In a good way. The Neptune speakers rest on your cheek and make the bone vibrate so that the vibrations can be relayed to your cochlea, allowing you to hear music. The process is called "bone conduction," and is also used by some marine mammals. Since the music is going straight into your head, you don't have to deal with anything in your ears while you're trying to swim.